I just made muffins. I sorta followed a recipe, but the recipe wasn’t gluten-free or egg-free, so I kinda ran with it and did my own thing. How many times have I made muffins that have come out just fine without me following a recipe? But you know what? I didn’t really make muffins, because they didn’t really come out as muffins. They were wayyyy too gooey even after nearly an hour of baking, even though they seemed the right consistency going into the oven. This usually doesn’t faze me anymore. I don’t usually cry over a failed recipe unless I have dinner company arriving in 10 minutes—and sometimes, not even then, anymore. There was The Great Chili Disaster of 2008: I forgot you can’t cook beans in acidic water, and I put the beans in the same time as the tomatoes. I didn’t remember until I’d wasted a lot of ingredients (beans, meat, corn, tomatoes, gf beer, spices) and company was due any minute. Company arrived—laughed, commiserated. We discussed possible remedies. We discarded them. I threw away the chili, and we went out to eat. I’ve accepted that being gluten-free and allergen-free means you have to roll with it. It means I waste some ingredients, yes, and it definitely means I waste some time. But it’s also true that those wasted ingredients and that wasted time are, in another sense, not wasted at all, because they often lead me to new understanding. Failure can either set us back or teach us, right? Certainly, it’s sometimes both. I prefer to try, to try, to think about the growth and not the setback. That doesn’t mean I never get frustrated. Last week, I wanted to make a hazelnut pear cake as one of my fall recipes. I can’t tell you how many loaves and pans of pear cake I made (the texture was all wrong, seemingly no matter what I did, and I tried a huge number of variations) before giving up and moving on to another idea. The next morning, I knew the kind of pie crust I wanted to create for the magazine article. I was a day behind after wasting a day on the pear cake with no usable result. I proceeded to spend the next 14 hours making pie crust, sometimes baking it with a filling, and always throwing it away. At 11 p.m., my back, arms, and legs ached; it was well beyond being fun anymore. Fortunately, when the 11 p.m. iteration came out of the oven and I bit into it, I went, “This is it.” Finally. My husband agreed. Yesterday, when I used that same pie crust recipe for the groom’s ‘pi pies’ at the reception of a friend’s wedding, people were shocked to learn the pie was gluten-free, and they—truly—gobbled it up. The 14 hours of experimentation was worth it just for that, not to mention for the tasty treats that that pie crust will offer my future. Congrats…I’m glad your sweat and tears yielded something delicious. 🙂 I had generally the same problem with the OTHER pie crust I made for you. You are a wonderful friend. And I will eat, with complete confidence, anything you make. Including when you could eat tofu and you made me tofu and I really had hated it up til then, but you made me love it. That, and Brussels sprouts. But it is good to remember that each mistake teaches a good lesson. I TOTALLY hear you. I made this huge rice salad yesterday…. I actually doubled the recipe because, well, why not? But the recipe called for brown rice vinegar in the dressing, and I suspect that I might not be able to tolerate rice vinegar for whatever reason. I’m not sure yet. I have to test it again tomorrow which I’m not really excited about as it means that I’ll have a headache if I am, in fact, intolerant of it. I’ve definitely had to throw out recipes, especially in baking. It just works or it doesn’t. Think of it like scratch paper….. how many pieces of paper do I toss in the process of writing out one lesson plan or a unit plan? A lot. Your pi pies are beautiful!!!!! 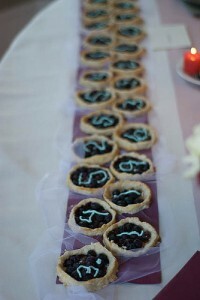 The pi pies were phenomenally good. So gooey and wonderful! I lamented being exhausted and stuffed into a wedding dress so tightly that I couldn’t eat about 10 of them! *sigh* Wish I could have been there–they look fabulous! Thanks for this, Sally! It’s hard not to get super irked when a culinary endeavor totally bites it, and this is a really helpful reminder.